The Expanded Panama Canal is now officially open for business. During today’s official inauguration ceremony, Panamanian President Juan Carlos Varela and Panama Canal Administrator and CEO Jorge L. Quijano spoke to a crowd of more than 25,000 jubilant Panamanians, Canal employees, heads of state and dignitaries from around the world, Canal customers, shipping and trade executives, and nearly 1,000 journalists. This is the first expansion of the waterway since its original construction. “Canal users can be assured that we’ll continue to support the Panama Canal Authority and our port operators to provide them a world class service and strengthen our logistics system by creating the necessary incentives and conditions to give added value to our inter-oceanic route,” said Panamanian President Varela. 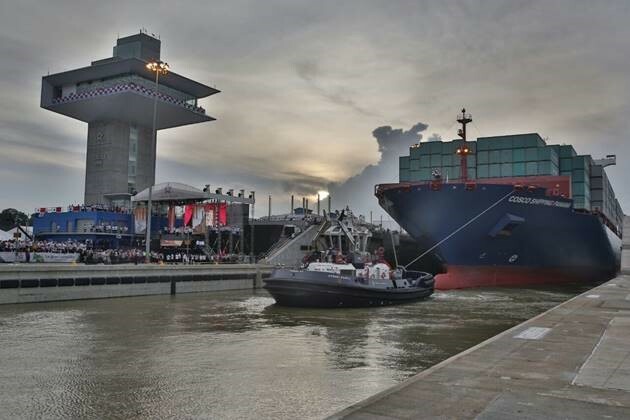 The inaugural transit began with the passage of Neopanamax vessel COSCO Shipping Panama through the Agua Clara Locks on the Atlantic side of the country and concluded with its transit through the Cocoli Locks on the Pacific side. The ship is en route to Asia. Considered and analyzed with more than 100 studies, the Expansion will provide greater economies of scale to global commerce. It will introduce new routes, liner services, and segments such as liquefied natural gas (LNG). The Expansion Program is the Canal’s largest enhancement project. In 2006, more than 75 percent of Panamanians approved the project in a nation-wide referendum, and, in 2007, construction of the $5.25 billion project began. It included the construction of a new set of locks on the Atlantic and Pacific sides of the waterway and the excavation of more than 150 million cubic meters of material, creating a second lane of traffic and doubling the cargo capacity of the waterway. In 2015, the original Canal set a tonnage record, transiting 340.8 million PC/UMS. It will continue to operate, transiting Panamax-sized vessels or smaller. While the Expansion’s locks are 70 feet wider and 18 feet deeper than those in the original Canal, they use less water due to water-savings basins that recycle 60 percent of the water used per transit. COSCO Shipping Panama set sail June 11 from the Greek Port of Piraeus carrying 9,472 TEUs and measuring 299.98 meters in length and 48.25 meters in beam. Originally named Andronikos, the vessel was renamed to honor and pay respect to the country of Panama and the Canal. In line with its commitment to customer service, the Panama Canal will continue to provide the world with value for another century and beyond.